New signing Jorge Grant is already exceeding expectations at Kenilworth Road according to Town boss Nathan Jones. The 23-year-old joined on a season-long loan from Championship outfit Nottingham Forest last week in time to head out to Slovenia with his new team-mates. 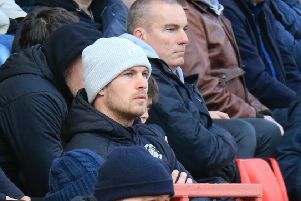 Grant got his first 45 minutes in a Luton shirt, playing the opening half of Friday’s 2-0 defeat to Rijeka, as on how he has settled in, Jones said: “Jorge is everything we thought he would be, even better – and he will get better still within our environment. “It’s a wonderful signing. I’m very pleased he’s shown what a good player he is already this week, which is good, because we like bringing good players into our environment to up the tempo and the quality levels, and then the others respond to that, so it’s been good.